In recent years there has been an abandonment of historical survey shows by the Whitney Museum and Boston's ICA. They are time consuming, complex and expensive research projects. Most importantly they require committed and knowledgeable curators. Some decades ago one looked to venues other than MoMA and the Guggenheim to take on critical overviews of modern and contemporary art. For the Whitney that has come to mean the overkill of a Jeff Koons show or MoMA's widely panned exhibition by pop star Bjork. Under former ICA directors Stephen Prokopoff, David Ross, and Milena Kalinovska there were a number of truly remarkable shows of an historical nature. On their watch the kunsthalle was an invaluable resource for educational exhibitions. Considering the critical mass of colleges and universities in Boston there were many teaching opportunities. As a professor of art history I assigned these shows to students and conducted classes at the ICA. Since the move to the waterfront these historical shows, until now in a big and important way, seemed like a thing of the past. There has been a shift toward young curators wanting to promote the art of their own generation often with very mixed results. There are not a lot of winners in ultra contemporary art. It takes time to filter out and evaluate emerging art. Eventually the current emphasis on gender, race and identity will be vetted and reordered. This is the natural process of art history and there is always a seismic generational gap between my music and your music. The survey of the all important Black Mountain College experiment from 1933-1957 allows us to look back at a charged period when through the disruption of war in Europe many of the most important artists and creators regrouped in America. Relatively speaking, when the college was founded, the arts in America were conservative and even reactionary when compared to the European avant-garde. Under the bucolic conditions of the poorly funded and rural small experimental school there was a remarkable confluence of advanced ideas from Europe interacting with a handful of the best and brightest Americans. As with so many utopian experiments it proved to be unsustainable. Even though it fell apart the seed of an American avant-garde was planted. In a pentecostal manner the artists became the matrix for the paradigm shift from the demise of the School of Paris to the global dominance of the American arts from the post war era through Global Pop in the 1960s. With the proliferation of biennials and art fairs one may argue that today there are many epicenters for advanced arts. This all important ICA exhibition, however, allows us to see in depth a moment when a critical mass of that space time continuum was roughing it down on the farm in North Carolina. This promises to be one of the most interesting and influential exhibitions of the fall season. This October, the Institute of Contemporary Art/Boston (ICA) opens the first comprehensive U.S. museum exhibition on Black Mountain College (BMC), a small, experimental school in North Carolina whose influence on art practice and pedagogy still has profound impact today. Leap Before You Look: Black Mountain College 1933–1957 focuses on how, despite its brief existence, Black Mountain College became a seminal meeting place for many of the artists, musicians, poets, and thinkers who would become leading practitioners of the postwar period. Figures such as Anni and Josef Albers, John Cage, Merce Cunningham, Robert Rauschenberg, Elaine and Willem de Kooning, Buckminster Fuller, Ruth Asawa, Robert Motherwell, Gwendolyn and Jacob Lawrence, Cy Twombly, Franz Kline, Charles Olson, and Robert Creeley taught and studied at the college, among many others. The exhibition follows a gentle chronology, organizing the material in thematic sections, allowing each gallery to elucidate various aspects of BMC’s practice, pedagogy, and philosophy. The exhibition subsequently focuses on Anni and Josef Albers. Josef Albers was hired from the Bauhaus in Nazi-era Germany to become BMC’s first art faculty. Given the centrality of his pedagogy, and Anni’s writing and weaving, to the BMC experience, this room is dedicated to their work, including prints, paintings, photographs, and weavings made by the Alberses during their tenure at the college from 1933 to 1949. One highlight is the many trips the Alberses took to Mexico while they were at BMC and the impact these visits had on their work and teaching. Included are Anni Albers’s Monte Alban (1936), a large-scale weaving in which the strict geometry of the grid is combined with the wandering outline of Zapotec architecture, and Josef Albers’s Tenayuca (1943), an abstract painting inspired by the stairways and platforms of the eponymous Aztec pyramid. Viewers are introduced to BMC pedagogies, which all shared the ideal of “learning through doing.” The exhibition contains work and photographs from Josef Albers’s courses in design, drawing, color, and material studies. Also exhibited are the collaborative work of students and teachers, such as jewelry made by student Alexander Reed with Anni Albers using every day materials such as corks, paper clips, and bobby pins. Models and studies for Buckminster Fuller’s geodesic sphere, first erected at BMC, are included alongside an examination of the role architectural building played at the college. These didactic tools exemplified the college’s mission to teach through hands-on experimentation. Black Mountain College was a cosmopolitan gathering place for artists from Europe, Asia, and the United States, making it a place where a wide variety of ideas and artistic practices converged. The exhibition explores the concept of cosmopolitanism as a framework for understanding the unique position of BMC as a conduit between European and American avant-gardes which profoundly shaped the development of postwar artistic practice, teaching, and identity. Works by European artists such as Xanti Schawinsky, Lyonel Feininger, Ilya Bolotowsky, and Josef Breitenbach are presented alongside paintings by a younger generation of American artists including Elaine and Willem de Kooning, Robert Motherwell, Gwendolyn and Jacob Lawrence, and Franz Kline. While there is no such thing as a Black Mountain aesthetic, the exhibition puts forward the idea that BMC generated a rich field of art, craft, and performance with a shared interest in the tactility of materials, the process of making, and the bodily engagement of the maker. Profoundly interdisciplinary, BMC gave rise to one of the 20th-century’s most legendary artistic collaborations: that of Merce Cunningham, John Cage, and Robert Rauschenberg. The exhibition features a sprung dance floor for live dance performances (see performance section below); a grand piano that will be “prepared” according Cage’s specifications; and a freestanding set decoration by Rauschenberg titled Minutiae (originally 1957). The final gallery focuses on the college in the 1950s, a period when poetry and pottery took on especially significant roles at BMC. In his influential essay “Projective Verse,” the poet Charles Olson (the final BMC rector from 1951 to 1957) reimagines poetry as a field of action, emphasizing the use of the entire page and the importance of breath. These ideas became a catalyst for a generation of young American poets, many of whom Olson invited to teach at BMC, including Robert Creeley and Robert Duncan. This gallery examines the college’s critical role in the development of experimental literature in the United States. At the same time, the BMC pottery shop was formed and a series of influential ceramic artists taught at BMC, including Robert Turner, Karen Karnes, and Peter Voulkos. Many of those involved with pottery at BMC would lead the modern studio pottery movement in the United States. Leap Before You Look includes a 20 x 20 foot sprung dance floor to accommodate weekly, in-gallery performances. The ICA is working with the Merce Cunningham Trust and Silas Reiner, a former Cunningham dancer, to restage selected early Cunningham dances accompanied by live music. Students from the Boston Conservatory and Harvard University will work with Reiner to prepare performances and demonstrations to take place in the gallery. The ICA is also working with choreographer and performer Pauline Motley to perform BMC dance teacher Katherine Litz’s Glyph dance. Leap Before You Look also includes a grand piano. For a limited period of time during the exhibition, the piano will be “prepared,” using a method developed by Cage through which the piano (and its sound) is altered by the addition of screws, erasers, and other pieces of hardware to the strings, dampers, and/or hammers. The process of preparing the piano will be open to the public, so that visitors can see how it is done and engage in conversation with the preparator. Between 1949 and 1954, composers Pierre Boulez and John Cage exchanged a series of letters in which they discussed compositional practices and the current culture. Members of the French ensemble intercontemporain, founded by Boulez, will perform a selection of works by Cage and Boulez composed during this epistolary period and also read excerpts from the letters themselves. The ICA has invited artist Kelly Nipper; artist Jonathan Calm; poet Damon Krukowski; musician Tim McCormack; and Boston Poet Laureate Danielle Legros Georges to reimagine John Cage’s Theater Piece No. 1, the first “happening” and one of the most oft-cited events in BMC history. Theater Piece No. 1 was arranged according to a simple “score” that allotted each performer a set duration of time in which to perform an activity. The five aforementioned practitioners will each propose a series of actions to take place over the course of the exhibition (whose dates will serve as the “score”) that together constitute a reimagining of Theater Piece No. 1. This project re-animates the first happening by inviting contemporary artists to respond to its history and to consider its legacy in dialogue with contemporary art, practice, and culture. Music was a central part of the BMC curriculum and experience. The ICA has developed a soundscape, organized by John Andress, ICA Associate Director of Performing Arts, to accompany the exhibition and assure that music is part of the gallery experience. This soundscape consists of four playlists drawn from the BMC repertoire (music taught and performed at the college) that will be played through the gallery space. Among the composers included are Bach, Beethoven, Pierre Boulez, Miles Davis, and John Cage. Leap Before You Look is accompanied by a fully-illustrated, 400-page catalogue published by the ICA in association with Yale University Press. The catalogue includes an essay by Molesworth focusing on the interrelated themes of art pedagogy, progressive education, democracy, and cosmopolitanism. Molesworth has invited contributions from more than 20 scholars, both senior and junior, who possess specialized knowledge of a variety of topics from the history of weaving and ceramics to modernist music and American poetry. The catalogue’s diversity of voices mirrors the mixture of objects in the exhibition and the spirit of BMC. Authors include Harry Cooper, Eva Diaz, Steve Evans, Jennifer Gross, Jonathan Hiam, Katherine Markoski, Nancy Perloff, Jeffrey Saletnik, Alice Sebrell, Jenni Sorkin, Gloria Sutton, and many others. 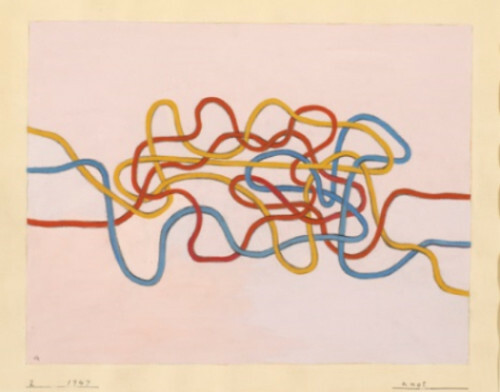 Image: Anni Albers, Knot 2, 1947, gouache on paper, 17 x 21 1/8 inches. © The Josef and Anni Albers Foundation/ Artists Rights Society New York. Photo: Tim Nighswander/ Imaging 4 Art.